For the past few years, political and socio-scientific debate has centred around the concepts of empire, immaterial work, multitude and commonwealth. In what follows, I would like to address the issue of “multitude” within this debate. Where does this term come from? What does the term mean? And what can we do with (the meaning of) this term? Below I will try to approach different aspects of the term. First picture: The proletariat affects development: operaism! 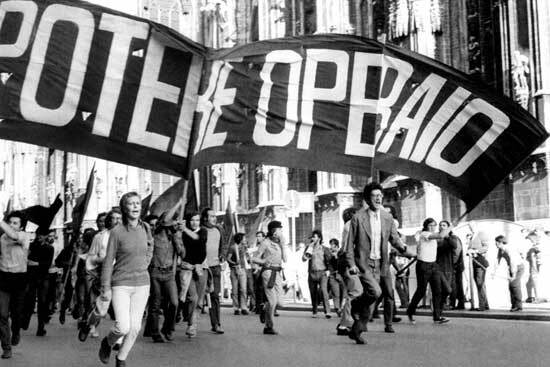 In Italy, Germany, France and other (European) countries there was a strong, complex, leftwing political movement enduring the late 60s and early 70s. During this period, a new line of political thinking emerged in Italy. It was called “operaism” and the central point of this term is/was ”doing” or “action”. During this period, a lot of Marxist theories were discussed. However, the focuses of these theories were mostly limited to the different stages of development of capitalism. The reaction of the proletariat to these developmental stages was also questioned. The operaists reversed this point of view and suggested the opposite. They argued that the proletariat (i.e. the working class) determined the development of capitalist society. The power of the working class determines wages, the scope of social security benefits and the social infrastructure of society. The capital is only able to react. It exerts influence on the society by improvements in productivity by relocation of enterprises or by liberation from the manpower of the employees (for instance by implementation of new technologies instead of employees). Still, capital is dependent on humans (who work to produce this capital). The presentation of this idea had an essential impact on the term multitude. Humans created and changed the shape of the society day by day through their acting, thinking, feeling and through their intentions. The idea of consumer protection is a concrete example which works in the same way. The behavior of consumers has an impact on the way things will be produced. One of the masterminds of operaism is the Italian Toni Negri. In 1979, he was arrested because he was accused of beinga mastermind of the Italian terrorists as well. During his first year in prison he studiedthe philosophy of Baruch Spinoza (1632 – 1677). Spinoza descended from a Jewish family, and emigrated from Portugal to Amsterdam. Spinoza studied the Talmud (just as every Jewish person did). Aged 23 he was excommunicated from the Jewish community, probably because of his insistence that the Talmud must have been written by humans (because of all the faults in it). But his philosophical thinking furthermore moves around the concept of the „one substance“. Toni Negri interprets Spinoza‘s writings in a radical new way. The idea of one substance has to be understood as an alternative concept to all the transcendent concepts, which operate with terms like „god“, „sovereignty“, „leadership“, „governance“, and so on. These transcendent concepts will postulate a new and better reality to bring the multitude under control. The multitude is not structured, potentially dangerous and must be transformed into a nation. And the leadership of the nation is responsible for improving a better future. So – in short– the position of the majority of philosophers ,for example René Descartes or David Hume, who oppose the idea of multitude. In the history of philosophy, Spinoza is a unique thinker. He did not refer to a specific philosophical tradition or school and he did not found a Spinozian school. But according to the operaist idea that the working people will determine the development of the (capitalist) society, we find here a focus point of a philosophic al tradition, which is basically materialistic. It is a concept, which tries to understand the variety of being, the power of being and the possibilities of being. In spite of the structure of human society, one can point out that there is no determination or destination, everything is open and society has to negotiate about all issues. So, it is not suprising, that Toni Negri liked Spinoza’s theory. The multitude is able to rule everything. But the question is: Why should we concentrate on this? The reason is, that we have to face a dramatic change of the mode of production. Third picture: From Fordism to digital global capitalism. The ancient picture of the capitalistic mode of production as Karl Marx discribed it, is the factory and the assembly line. Henry Ford was the first one to use this systems in his factory to build cars, and so the whole principle of assembly-line-based production was called Fordism. And it is the assembly line which creates the figure of the working class. Everybody will remember the motions of Charlie Chaplin in the movie Modern Times. This was a long time ago, and we have not the time to examine the whole devolopment until today. So let‘s jump to the current situation. The picture of the current mode of production is a young, dynamic, flexible, highly educated and creative person sitting somewhere in the world in a big city, in a bar, working on a web-linked notebook on a temporaraly project. It was Peter Glotz, who pointed out many years ago, that one can describe this phenomenon however one wants, but one will sjust face the old principle in new clothes, he called it "digital capitalism". No one can fill his belly on immaterial work, or can he? How could this be the dominant norm of production? It is evident, that different types of wage-related work have not disappeared, and that conventional factory work, agricultural work and other types of work still exist or will be reconstructed. But immaterial work is dominant, because of its ability to rule and to organize all other types of work. But the significant difference between the factory and the computer connected to the world-wide web is that the assembly line is a programmed automat, but the computer is a programmable robot. So the computer is able to subsume all kinds of machine imaginable . But this is not all - the computer is also a communication tool, a means of communcation: through email, web, chat, video-conferences and so on. The newest software even allows us to work together on a common project across any distance. At the same time, this power-instrument is not in the factories, but in the hands of the workers. In a further step of generalisation one can say that everyone could use it as his tool. But thereby the structure of work will change also: It is no more the monotonous repetition that we will all know. By working on a linked-up computer we will create social relations, we will fabricate culture, we will organize neighbourhoods, we will structure family cohesion and friendships, we will develop education and constitute political structures, and even create and maintain emotional- and relational work. The computer industry is ruled by big commercial companies, and the internet, the hardware and software production as well. But on the other hand, we have a strong movement of common free software, open source codes, open networks and so on. So more and more the linked-up computer is coming into the hands of the working class. But one does not have to be a worker to use this technology. Everybody can use it. It is on the way to becoming a common tool. And so immaterial work could be a motor of transformation of human individuality, or – in the words of Spinoza – of human singularity. The end of the real existing socialism was caused by riots and struggles of people in Czechoslovakia, Poland, Hungary, the GDR, but was also caused by new ideas of „glasnost“ and „perestroika“. After the breakdown of the socialist hemisphere – I would not like to talk about the exeptions of Cuba and North Korea) and together with the shift from the factory work of the working class to the new dominant structure of immaterial work done by creative workers, we face a deep crisis of left-wing, socialist and communist ideas and movements as well. It seems as through the working class, the proletariat, has disappeared. From time to time there is a strike or a workers‘ struggle, from time to time there is a so-called „left-wing government“, but all of this is not very effective in terms of ending capitalism. Instead of this we are concerned by wars, financial affairs or bankrupt states. In a new concept the philosophers around Toni Negri combine the reality of a new structure of work as immaterial work on the one hand and the concept of the multitude on the other. In the global age the multitude has the possibility and the power to devolop a new way of life without exploration, without destroying nature, by building and creating new kinds of capabilities and networks and democracy. There is no longer a need for ideology, for nations, for government, for leaders, for financial markets, for military, for war, for slavery. Instead of this, the singularities of the mulitutude must rule, what must be ruled in a common world. The division of labour, the supply of energy, the education of children, healthcare, respect for all the variety of cultures and traditions, the diversity of languages and life-styles and so on. I am sure that there a lot of questions about this concept of multitudes, and a lot of theoretical and pratical problems we have to discuss and to solve. But it is a powerful idea of the future, a vision of humankind. One could be inspired by that, because in my opinion it will broaden our horizons and give us the chance to focus on the real things. This is why I wanted a give you a brief introduction to this term.